Leadership and control were the order of the day as Hereford cadets from two county schools lined up side by side for their biennial Combined Cadet Force (CCF) inspection. Pupils from Hereford Cathedral School and Whitecross High School were on parade at the Suvla Barracks in the city when they were inspected by high ranking personnel. The inspecting personnel included Lady Darnley, Lord Lieutenant of Herefordshire, Air Commodore Richard Atkinson CBE (OH), Rear Admiral Philip Wilcocks CB, DSC, DL (currently a Governor at HCS) and Captain Sarah Hunter-Choat (OH and daughter of Brigadier Hunter-Choat). 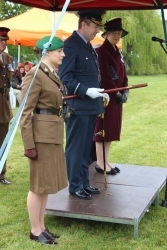 As is traditional, Sarah was wearing the Silver Sword she was awarded from Sandhurst. During the inspection there was a special presentation of the newly commissioned Hunter-Choat Pace Stick (in honour of Brigadier ‘Tony’ Hunter-Choat) to the CCF Cadet Warrant Office by the Reviewing Officer, Air Commodore Richard Atkinson while Captain Hunter-Choat proudly looked on. Brigadier Hunter-Choat’s wife, Linda and their other daughter, Felicity were also in attendance. Air Commodore Atkinson said "I have met many confident, caring and capable young men and women today, and staff to match them; HCS is giving a great foundation for life".